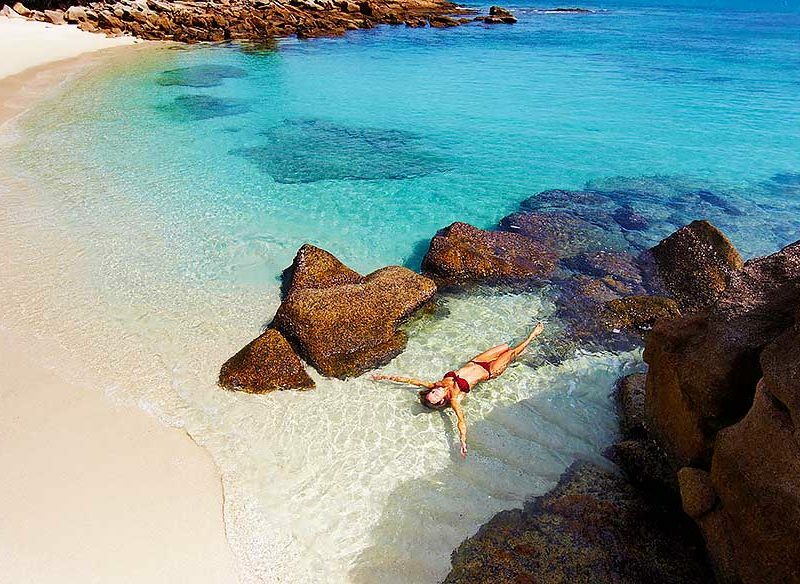 If you’re looking for a beautiful, tranquil setting for rest and relaxation, look no further than beautiful Lizard Island. Lizard Island is unique among the island resorts on the Great Barrier Reef. It’s neither a coral cay nor part of a group of islands. It is a remnant of a mountain range which, when the sea level was lower, was totally exposed. Now it’s a small, relatively dry island which in many ways is reminiscent of the Greek islands in the Aegean Sea. Rocky outcrops of granite. Dry, sparsely vegetated hills. A pleasing barrenness tumbling down to coral-white beaches and aquamarine waters. And a stirring sense that there is something magical to this spot. Lizard is Australia’s northern-most island resort. It is located 270km north of Cairns, 29km off the coast of North Queensland and 22km from the Outer Reef. Access to the island is restricted. The resort facilities are only available to in-house guests. Privacy, which the resort regards as paramount, is guaranteed. The promise of privacy attracts regular A-list visitors, most of whom are happy to go unnoticed for a few days. The resort’s distance from the coast and from Cairns also means mobile phones don’t work, making this truly a place where you can leave it all behind. Lizard Island was known as Dyiigurra to the local Dingaal Aboriginal people and was regarded as a sacred place. The Dingaal believed that the Lizard group of islands was created in the Dreamtime. They saw it as a stingray, with Lizard Island being the body and the other islands in the group forming the tail. The first European to explore the island was Captain James Cook, who anchored in one of the bays and climbed to the top of the hill now known as Cook’s Look. He wrote of the island: “It is mostly high land, very rocky and barren except on the NW side, where there are some sandy bays and low land.” Cook saw numerous lizards (Gould’s sand monitor) on the island and not much else, so he quickly sailed away having named the place Lizard Island. Other Europeans of note to have since landed include a holidaying Prince Charles, who dutifully planted a tree on the front lawn. Republicans can avoid its shade. Most visitors arrive on Lizard by small, 19-seater Twin Otters which are flown from Cairns airport by Mac Air. The flight over the Inner Reef is heart-stoppingly idyllic. Below the reef itself, looking like some vast, flat piece of mottled blue opal, gleams in the sun. After an hour the island, with its picture-perfect Blue Lagoon and its small outlying islands – Palfrey, South Island and Seabird Islet – comes into view. The airstrip cuts across the island from Anchor Bay, where the resort is located, to Mangrove Beach on the southern side of the island. Upon landing, luggage is whisked away as visitors are greeted, taken to reception, provided with fruit juices and champagne and briefed on the resort’s routine. The first impression of Lizard Island is one of intimacy, relaxed friendliness, casualness and an informal attention to detail. What’s it like on the island? Few resorts in Australia can boast a more idyllic setting. A well-kept lawn edged by palm trees which rustle in the tropical breezes gives way to a few metres of undergrowth before the visitor walks onto a coral-white sand beach, where the gentlest of slopes drops into impossibly clear and green-blue waters. At various points, no more than a few freestyle strokes from the shoreline, corals of unimaginable beauty, turtles and small brightly coloured fish await the snorkelling enthusiast. This is unique. Nowhere else on the entire Great Barrier Reef can a holidaymaker, staying on an island of granite, enjoy the reef so directly and so completely. Go to Hayman or Bedarra and you’re confronted with a 90-minute journey before you get to the reef. Go to Lizard and gardens of underwater coral are within a minute’s walk. That’s what makes Lizard so special. In recent years, the resort has been refurbished. The buildings – all unobtrusive, low-key timber cabins which, with few exceptions, house two apartments (with no interconnecting rooms) – have been fitted out in the minimalist quasi-Asian style currently so popular in such places. Life at Lizard doesn’t come all that cheap – but it’s the quality you pay for. The resort has a total of 40 guest rooms with four different grades. Overlooking Sunset Beach, and the most private of all the rooms, is the luxury villa called The Pavilion, which is a double room (not available as a twin share) with its own plunge pool and dramatic views. It’s worth $1500 per person per night. The Sunset Point and Anchor Bay suites are $900 per person per night and the Anchor Bay rooms, an older classic style, are $780 per person. These costs include all meals. Drinks are extra. They also include a substantial range of free leisure activities including catamarans, paddle skis, windsurfers, guest internet, use of the lone television in the guest lounge, free and extensive supply of CDs and DVDs, a tennis court, guided walks, gymnasiums, guided snorkelling and tuition and – most appealing – the opportunity to take your own motor-powered dinghy, complete with a picnic lunch, and find your own beach around the island where you can swim and sunbake. All rooms look over the beach and therefore it’s hard to argue that any are demonstrably better than others. Room 30, which is where I stayed, is just perfect. Ceiling fans, complemented by a quiet wall air conditioner, keep the temperature constant while creating a delicious illusion of old-style tropical indolence. The front veranda, with its comfortable and padded deck chairs and its day lounge, offers both afternoon sun and views across the bay. The style of the room is tropical minimalism with polished timber floors, a large two-seater couch in a rich blue and cane chair with footrest and a king-sized bed. There’s a small desk and a single, tropical-themed print on the wall. Behind the bed, with its simple cane reading lights, is a shower, toilet and wash basins. For those who take sleeping seriously, the resort offers a pillow menu. Choose from full feather, Dacron, soft feather, V-shape, Body, Contour Multi-Profile, Foam and Comfort Junior. Note there is no bath in the room, but this is hardly necessary given the proximity of the spa, swimming pool and sparkling ocean. Actually, the reason for the absence of a bath is water. The resort draws its supplies from artesian levels – hence no baths. It also means, because the island is relatively dry, that this is the best place to stay during the summer months. The rain clouds that bump against the escarpment and mountains and bring downpours to Cairns, Port Douglas and Cooktown simply roll over Lizard, leaving the island relatively untouched. Perhaps Lizard Island’s greatest appeal, at least in terms of the resort’s services, is its exceptional food. It has long prided itself on being the best eating and drinking experience on the Great Barrier Reef, and this is supported by the excellent food offered at Ospreys Restaurant. Ospreys stretches along an open veranda where every table has views across the beach. Dinner, with the sun setting over Osprey Islet and Sunset Beach, is particularly delightful. It’s common for the manager to organise pre-dinner drinks so the island’s small guest community can fraternise while enjoying champagne, wines and excellent hors d’oevres. The restaurant itself offers a range of Mod Oz options with outstanding locally caught seafood and some of the best beef you’ll eat anywhere. If you happen to stay when the resort has its regular seafood barbecue you’ll be able to gorge, endlessly if you want, on lobsters and crabs. The meal is artlessly simple with the crustaceans, and fish, being barbecued. The only sauce offered is clarified butter. Simple and delicious. Every meal is different and there is an emphasis on light meals – no heavy sauces or jus – which are ideal for the tropical environment. All meals are included in the tariff and if you choose a picnic lunch there’s no extra charge. And for those feeling in a romantic frame of mind, there are two beach locations for that “special meal.” You have your own waiter and the setting is suitably private. Recently, a Sydney lad even used this option to propose to his fiancée. The engagement ring was hidden in a coconut shell. Lizard Island offers a range of activities which, because it is a relatively dry island, can be enjoyed all year round. There are a number of walks and nature trails, with the most energetic – which is usually accompanied by a guide – being a three to four-hour return hike to the top of Cook’s Look, which offers outstanding views over the whole island. More modest are the walk to Chinaman’s Ridge, just north of the resort, which takes around 40 minutes, and the walk to the ruin of Watson’s cottage, which takes around an hour. A real change of both scenery and lifestyle can be had by simply walking the length of the island’s airstrip – which takes only about 20 minutes – to the beautiful, unspoilt Blue Lagoon, where both swimming and private sunbathing are desirable options. Nearby is the Research Station. There are guided tours twice weekly and the work of the tropical scientists, who live on the far side of the island, lies in stark contrast to the easy luxury of the resort. It’s really the water activities which hold the most appeal to visitors. The easiest thing is simply to go to the Activities Centre at the southern end of Anchor Bay, get yourself suitable snorkelling equipment, and just go out and mooch around the gardens of coral. For those who don’t want to get wet there is the glass-bottom boat, which makes its way each day across the corals in Anchor Bay to the particularly impressive Clam Gardens in Watson’s Bay. There are dinghies, catamarans, paddle skis and windsurfing equipment available, and both guided snorkelling and snorkelling tuition are available for no cost. For those seeking absolute privacy, it’s possible to ask for a packed gourmet picnic lunch and take a motorised dinghy to a secret beach anywhere on the island. Visitors wanting to experience something more challenging can charter boats for excellent marlin and deep sea fishing. The best of the scuba diving experiences can be had by joining the full day reef experience trip which goes out to the Cod Hole, where divers can sit on the ocean floor and watch giant cod the size of small cars floating around above them. The cost is $180 and dive charges are $130 for two dives. The island has two purpose-built dive boats – MV Coorcoran and MV Serranidae – both of which are available for private charter. Lizard may seem exclusive, but be warned: is informality is mandatory. While sophistication is the essence of Lizard, and the clientele will typically be aged between 30 and 55, most people have no desire to display their wealth or social position. Lizard does not permit children under the age of ten and doesn’t cater for kids in any way. There is no tariff reduction for meals or activities for children on the island. Trust me: this is a place for grown-ups who know exactly what they want. And they’ll likely find it. 5 night stay in Darwin before getting out of the city and exploring Nitmiluk Gorge, Leliyn Falls & the termite mounds of Litchfield National Park. An epic adventure to 2 of the Top End’s best natural experiences at Litchfield National Park & Kakadu National Park. Take an ultimate Red Centre journey with highlights including the West MacDonnell Ranges, Kings Canyon and Uluru-Kata Tjuta National Park.